Sure it was raining this morning but the sky is clearing up. In Ballsbridge across from the RDS, life’s astirring with stands set up to greet throngs of fans and visitors of both Leinster and Ospreys. The blue flags in support of Leinster is evident (hey, home ground, of course!) in the neighbourhood, and soon enough the pubs in the area will fill up with excited fans. This is our last chance of the season to win a silverware of some sort. After a disappointing Six Nations campaign, and crashing out of both Leinster and Munster in Heineken Cup at the semi-finals, we want a victorious game of the Magners League Grand Final! Let’s give Malcolm O’Kelly a triumphal sent-off before his retirement! Goooooooo Leinster – come on boys, you can do it! Posted in About Town, Events | Comments Off on Gooooo Leinster! What a game. One of the best I have seen and so nerve wrenching until the last minute. Great game. Congratulations to the Irish team for their brilliant effort throughout the competition. A well deserved win. 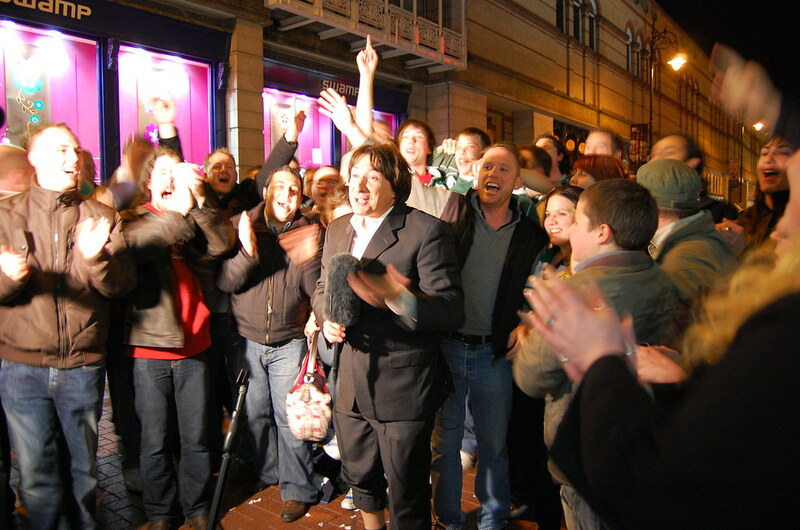 On grafton street, Irish Fans celebrating with a french TV presenter. More pics here. While am on the topic of sports, also Bernard Dunne claimed the WBA World super bantamweight title last night at the O2. Another great effort. Well Done. A great day for Irish sports.